Meg Whitman, CEO of HP, shows her best side with an air of self-assurance. The jacket and patterned scarf worn here show that even at the top, she is a leader who actively seeks to influence and nurture others. It’s rare when I observe Meg Whitman, in her capacity as CEO of HP, and think that she is looking either attractive or stylish. I can’t help but think that she could better accomplish a turnaround for HP if she presented a more polished, contemporary look. 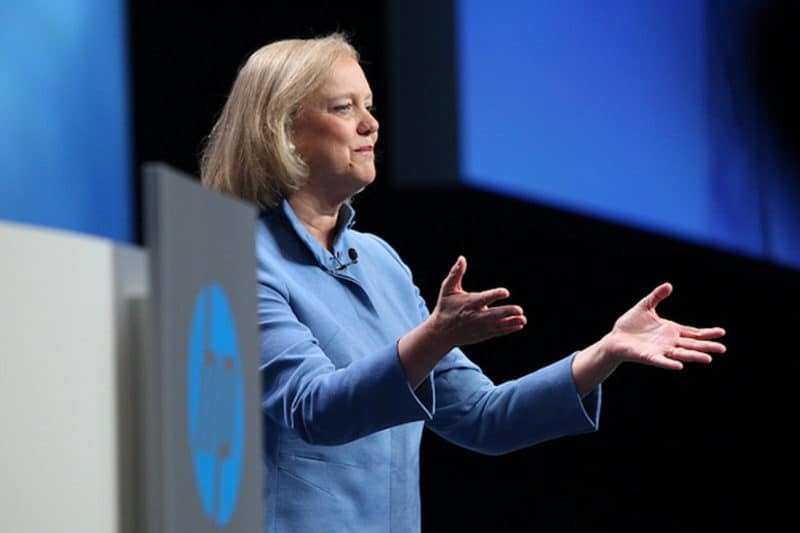 When it comes to personal style, it’s so easy to “dog” HP’s Meg Whitman. In fact, people who enjoy my strong criticisms of people’s personal styles have been waiting for the moment when I’d profile the style of Meg Whitman. And it is easy to go on the attack about her style. So, I’m not going to do that. Criticism is an important ability for an image consultant to possess. But, criticism isn’t productive without positive reinforcement, and suggestions and solutions to improve her situation. 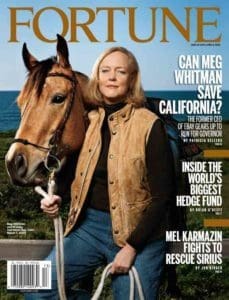 Do you suppose Meg Whitman was channeling Steve Jobs in this shot for the cover of “Fortune” by wearing the black knit top with “mom” jeans? I know that she was posed with a horse, but the stylist for this shot took horsing around to another sardonic level. You just have to feel a bit bad for Meg. For all those who love Meg Whitman as a CEO or as a political hopeful, it’s also really important to note that my criticisms aren’t about her management style, her politics, or about her being female. In these profile observations, I strive to be fair, balanced, and target a variety of highly prominent Silicon Valley senior executive leaders. Leadership management professionals concur that what has made Meg Whitman successful as a corporate leader is her cumulative early management experience. As a brand manager at Procter & Gamble, she put the customer first. Then she learned about the art of collaboration as a management consultant at Bain. The leadership experts say that she is a pro at building relationships, learning, listening, and using her influence to validate both employee and customer experiences. 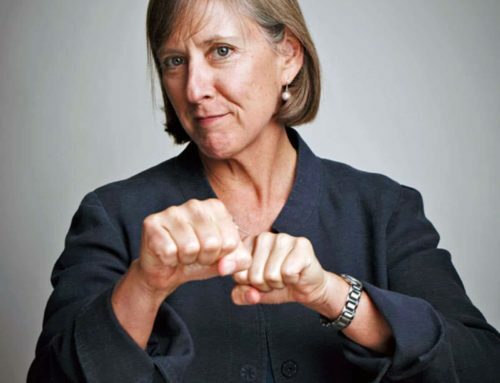 I’ll let the leadership management consultants decide how well those qualities are serving her in her role as HP’s CEO. But I do want to touch on these perceived personal characteristics and whether she pulls them into her visual personal style. Oh, how I wish this picture of Meg Whitman was more flattering. But click on it to see her eyes in high resolution. They are so amazing. I seriously would love to see her make the most of those pools of blue. 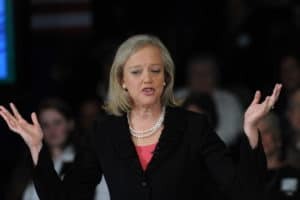 Meg Whitman would look more engaging than she typically does if she paid better attention to the colors she wears. To do this, I believe that she needs to wear stronger and deeper colors than what we typically see her wear. Colors in an outfit that are higher contrast to her hair and skin tone would make her look more influential. I would also play up heavily on her eye color. If you haven’t seen her eyes, they are an amazing gray-blue color. This color combination evokes a physiological response that she listens to others, and that she analyzes situations that come before her. Focusing on the eye color really helps her exude a set of core competencies and strengths. 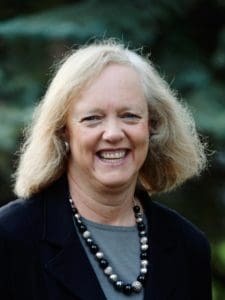 When it comes to her clothing style, Meg Whitman does well to wear jackets, either as part of a suit, or as separates with low-contrasting pants. As a uniform of sorts, this is more than appropriate for her role at HP. I like her appearance best when she introduces a scarf print beneath the jacket collar. It helps to frame her face, and makes her look more engaging and active. The danger of wearing too much gray is that she could appear passive. So boosting color and pattern in conjunction with the gray colors would help her to look less passive and more influential as a result of caring about the interaction she’s having with someone. This photo of Meg Whitman shows her knack for the perfunctory when it comes to her style. Jacket. Check. Expected jewelry choices. Check. But the lack of self-care is self-evident. A “Breck Girl” Meg is not! But if she put some effort into her hair style and maintenance and if she would do the same with a makeup regimen, she could turn this whole look around! It would take some effort, just as it does for many of us. I don’t like to see people let themselves go when there is so much potential. 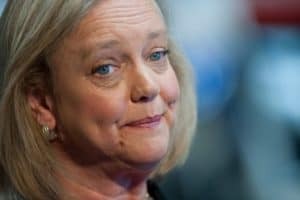 As for how Meg Whitman manages the balance of her appearance – her hair and skin – it would seem that she just doesn’t do much of it. 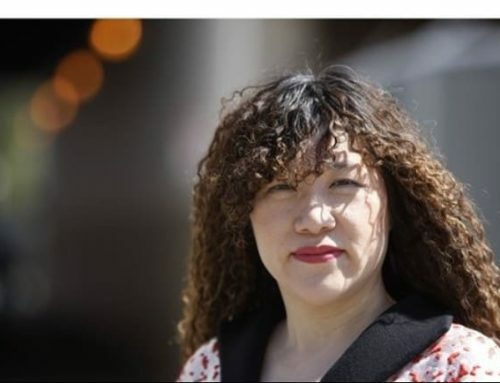 What’s really too bad about this is that she can leave others thinking that if she doesn’t care enough to manage her hairstyle or to properly apply makeup, she’d not apt to care about other obvious details, no matter how big or small. To be fair, running and restructuring a company requires an awful lot of strategic thinking, especially because thousands of jobs hang in the balance. 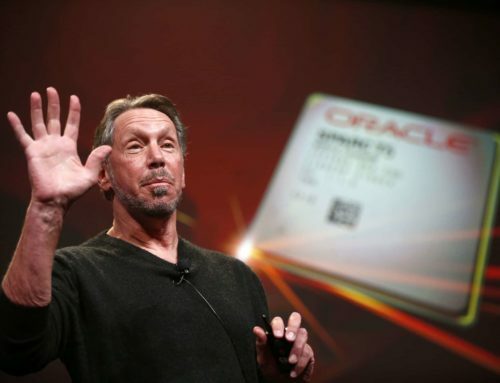 Also, the way the company does business can fundamentally change, as can the customer experience. But, as a public face of the company, and as it’s chief executive, Meg Whitman has a responsibility to take a few minutes every day to manager her personal appearance and style. Looking less corporate and more politico on the make, Meg Whitman’s visual brand is pretty cleaned up. She’s wearing higher contrast colors. Her hair is coiffed. She’s wearing makeup. The accessories are still at the level of what you’d expect. But she looks “on.” As CEO of HP, she should still look like she’s “on.” She may not be running for office, but she’s still running one of the biggest companies in Silicon Valley and in the country. On the campaign trail, and likely with the funds from campaign donations, it was easier and more accessible for Meg Whitman to have access to dressers, shoppers, hairstylists, and makeup artists. I say it’s more accessible because it comes with the territory when running for high public office. Also, she put a lot of her own money into that campaign, and I take that to mean that she’d have done all it would take to connect with voters, including managing her visual image and brand. Still, as CEO of even a huge public company, Meg Whitman is back to being a private citizen with a very public persona. She, and other men and women like her, ought to give very serious consideration to getting assistance in managing her personal style, brand, and image because she’s still on a campaign to turn around her company. To be successful at this goal, it is going to take everything she has to make it work.